Freddie confessed to his band members he had AIDS around the beginning of the recording of this album, though it was not announced to the public till the day before his death. 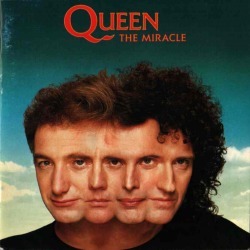 The album was originally going to be called "The Invisible Man", but three weeks before the release, according to Roger Taylor, they decided to change the name to The Miracle. “Party” started off as a jam session between Freddie, Brian and John. The song is about infamous Adnan Khashoggi and a ship that he owned at the time. Roger pulled a Freddie, and wrote part of the Invisible Man in the bath. The song “I Want it All” was inspired by Anita Dobson’s favourite motto.Tard.